The Fall 2010 semester marked the beginning of a new annual philanthropic event for the Beta Nu Chapter as members joined the National MS Society in its fight against Multiple Sclerosis (MS) in honor of friends, family, and alumni who have been diagnosed with the disease. Throughout the semester, Brothers solicited donations, sold t-shirts, and helped raise awareness about MS. This year's semester-long effort to raise money for the National MS Society concluded last weekend with seven Brothers participating in a 5K Walk in The Woodlands, Texas. The Beta Nu Chapter team raised a total of $1725, placing first in the school organizations category. In addition to participating in the walk in The Woodlands, Brothers also gathered information and established contacts with the National MS Society staff. It is with great inspiration that the Brothers plan to sponsor and organize a similar annual event in the Bryan/College Station area benefiting the National MS Society. Details about the Chapter's new annual philanthropic event will be made available in the Spring of 2011. 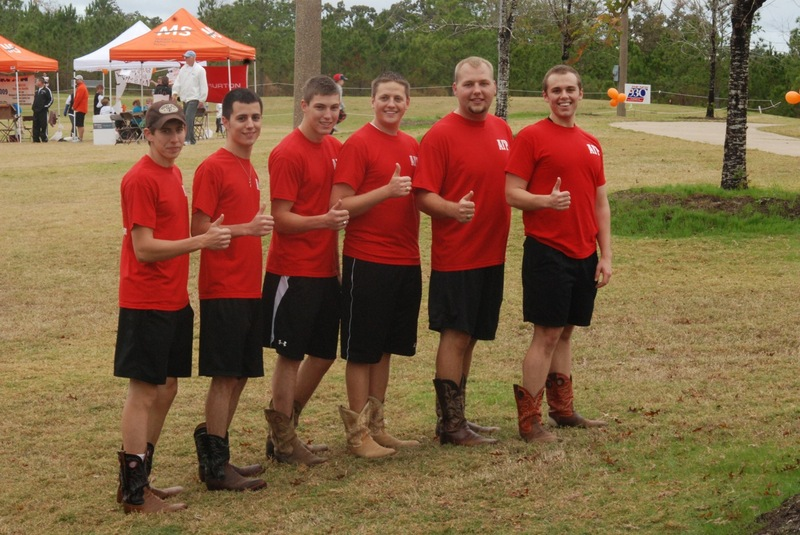 Pictured above: Brothers Logan Leschper, Anthony Lopez, Travis Tippit, Matt Okeson, Wesley Tobola, and Jake Riley "Giving MS the Boot" at the 5K Walk in The Woodlands, Texas.